When I was a young girl, my grandmother helped me learn ways to memorize my school lessons. Memory was a large part of an European education. Memorizing pages of poetry, Shakespeare, history lessons, multiplication tables, Russian or English vocabulary – was all routine part of our school day. I was always reading something out loud and trying to chisel it deeply into my brain. I would sit at our kitchen table, my grandmother across from me, and read my lesson out loud. When I was finished, she would ask me to summarize what I had just read. I would explain the plot to her in my own words. On evenings prior to tests (oral or written) my grandma would remind me to read my assignment before I went to bed. 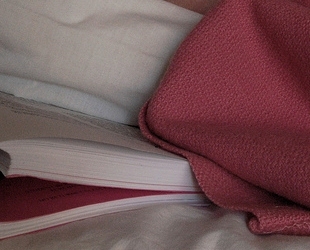 And then, as the last step in this process, I would place the book under my pillow and sleep on it. My grandmother said, and I earnestly believed it, that all the knowledge from my book would flow into my head as I slept. Frequently, I dreamed about Napoleon or the Russian revolution. And in the morning, it was magical! I would really know the information, and remember the minutest details of my lesson. Recently I read that scientists have discovered that repetition, reading out loud, summarizing the plot and consciously placing the physical book under one’s pillow, all help in retaining long term memory. The very act of believing that you will remember something, helps your brain remember it. My baba knew what she was doing! Through the long years of elementary school, high school, college and graduate school, I never varied my learning regimen. I studied for my lessons by concentrating, reading the information out loud, summarizing it to myself, and always, ALWAYS, sleeping with the book under my pillow. As the books got bigger and fatter, it was no easy task. But I believed in it so earnestly, that I was willing to suffer the consequences. A little pain in the neck was well worth the price. Of course, if you have a crummy memory like me, you can always choose instead to study math, where you only have to remember a few very basic principles and can then work out everything else from there. That was my saving grace! Thank goodness for our differences. It would be an awful world if we were all the same. This way we notice different things in life; for example, how some of us celebrate spring by admiring winter birds! This my dear is another true source to show everything that is old is new and the older generations with less book learning ability had to invent everything with the now lost art of common sense and pure desire to learn and invent. If we don’t oay attention to history it is sure to repeat itself again. You are so right, Dave. Happy Birthday to Janice! Have a great dinner tonight. Previous post: Happy International Women’s Day!